Here’s a project I just finished up for a customer. I am involved with a company that tears down houses. These are nice houses and I get a lot of nice material from them. This table is built using material from many of the different teardowns. The top is Brazilian Cherry most of the frame is poplar and thick yellow pine. One end of the table has a 4 foot long drawer and the other end has a 2 foot long drawer.. The guides were in one of the houses. The owner wanted it antiqued that’s why it looks the way it does. Great looking table! Love the color combo! I never seen drawer’s that long but I know they will come in handy for many kitchen items! Good job! Nice work but let me give few words of advice: round the corners. it’s hard to see in the pictures but all the corners have a slight 45 degree bevel. This is how the customer wanted it. Handsome island/bar. I wouldn’t mind knowing some construction details. The long drawer is—interesting. Guess practicality depends on use. Handsome island/bar. I wouldn t mind knowing some construction details. The long drawer is—interesting. Guess practicality depends on use. The drawer has full extension 48 inch drawer guides. They are pretty incredible. Supposidly they have a 500 pound load limit. They are very strong and weigh in at 37 pounds as a pair. The posts are glued up hollow posts. The bottom platform is mortised into the posts and the top rail is for into a notch for support. See pics. The top itself was Brazilian Cherry hardwood flooring. I had to remove the finish and re machine it before I could use it. It lays on a piece of 3/4 plywood with a band around it to make it look thicker. Very nicely done. I really like the way you have done the drawers. An all around handsome table. Exactly what I was wondering about. Building up material like that is a smart way to go, really well done. really nice table mark! don’t know if i like the look of the feet though. nice work, and i like the finish. That’s quite an eye catcher. I’d love to have one in my kitchen. And you just don’t see 4’ kitchen drawers ever day. I’d be interested in seeing what they store in that one. 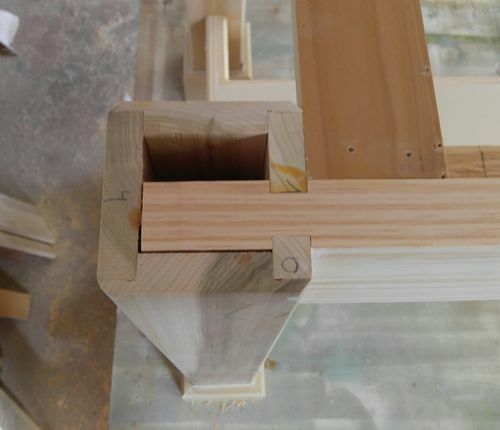 Pretty interesting joinery, I like those colours. Congrats for Daily top 3. Love this, Colors are great together and the construction looks really strong. I like the re-cycled work. The legs are great !